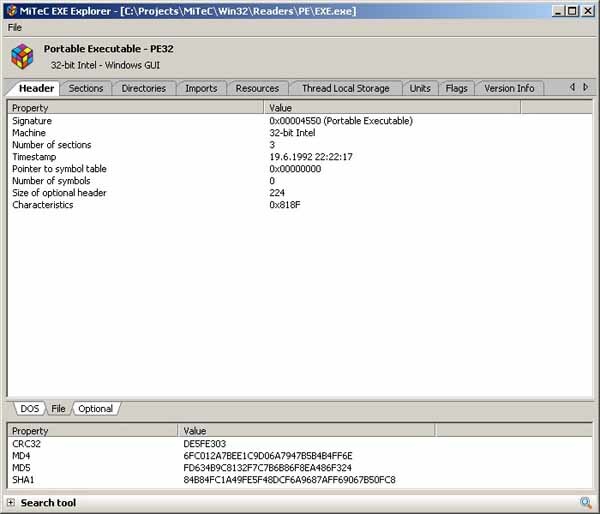 Free download MiTeC EXE Explorer latest version.This application is based on MiTeC Portable Executable Reader. It reads and displays executable file properties and structure. It is compatible with PE32 (Portable Executable), PE32+ (64bit), NE (Windows 3.x New Executable) and VxD (Windows 9x Virtual Device Driver) file types. .NET executables are supported too. It enumerates introduced classes, used units and forms for files compiled by Borland compilers.It contains powerfull Resource Viewer that is able to abalyze and display al basic resouce types and some extra ones as JPEG, PNG, GIF, AVI, REGISTRY. It contains excellent Type Library viewer that enumerates all objects and creates import interface unit in Object Pascal language. Every type of resource can be saved to file. EXE Explorer produces text report with all important information about selected file.Searching capability is also available. It searches all resources that can be interpreted as text. MiTeC EXE Explorer supports the following file formats: EXE, DLL, OCX, DRV, AX, VXD, SCR, BPL, DPL, CPL, and others.Once you have uploaded a file, MiTeC EXE Explorer automatically displays the information about it.